The present Survey is the eleventh in a series of reports prepared each year by the secretariat of the Economic Commission for Asia and the Far East. 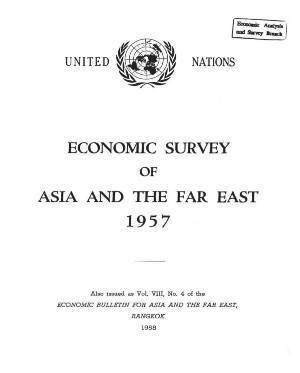 A major object of these Surveys, and of the quarterly Economic Bulletins which supplement them, is the analysis of recent economic developments in, and affecting, the countries of Asia and the Far East in so fa r as these developments are shaped by, and help to determine, their policies. Following the usual pattern, Part I of the present report gives a preliminary view of the economic situation in the ECAFE region in 1957. Part II marks a new departure. The systematic country chapters to be found in recent issues have been replaced by analysis of a series of problems of economic development encountered in various countries of the region in the postwar period. The chapters under this head deal with growth and structural change in a private enterprise economy, planned development in a mixed economy, industrialization in a centrally planned economy, export instability in the primary exporting countries, rehabilitation and reconstruction, and the land-locked countries. It is hoped that this new treatment will be found to heighten the interest and usefulness of the Survey. The secretariat proposes to continue to pursue new ideas in future issues to the extent that promising fields for, and methods of, analysis come to light.